SELL AT A FIRST GLANCE – that’s essentially what you want your product display to do. Point-of-purchase displays (POP displays) are designed to entice customers to glance at your product, but their ultimate goal is to convince the customer to buy it. In this day and age, where a significant number of shoppers make decisions based on first impressions, the POP display is the window of golden opportunity to sell your product. As an exclusive distributor for QuickSystem®, we carry high quality portable POP displays that are suited for a variety of needs. 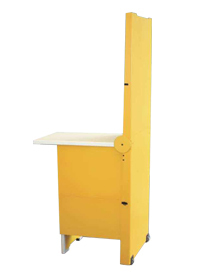 These award-winning quick assemble high quality POP displays are sturdy and ideal for industrial handling. They are found in many retail stores, outlets, and warehouse clubs where promotional packaging plays a critical part in a product’s success. 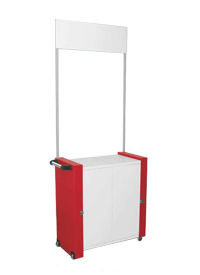 Our portable POP displays are ideal for launching your product in stores or at warehouse clubs. They can function as instant assembly and knock-down displays, perfect for temporary or reoccurring usage. All instant-assemble displays are sturdy, multi-purpose and can be dressed up to launch, display or demo your products within minutes. In addition, our instant assemble displays integrate very well with servicing customers – use our displays with built in counter tops, custom headers and wheels to make the most of your time. Traveling from place to place is easy with our semi-permanent displays. POP displays add the final finishing touch to your product and make it stand apart from the competition. 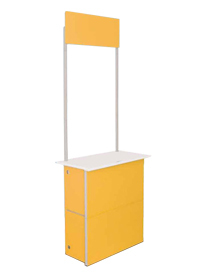 POP display setup assembles easily and does not compromise construction. Our POP displays are a great financial alternative to using disposable packaging. POP displays can promote a variety of products and services, ranging from food to electronics. 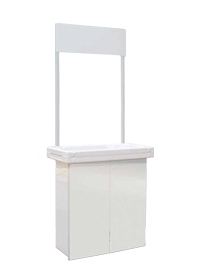 Our SimpleCounter POP display has the minimum amount of packaging display pieces required for quick assembly. It comes with back doors for secured storage access and has built in wheels for a POP display constantly on-the-go. MicroCounter is a light and economical solution for simple product sampling and promotion. It comes with basic POP display features and assembles into a handle case for easy mobility. 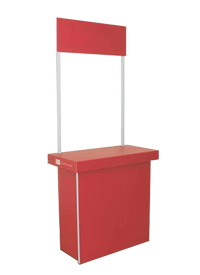 Create brand awareness by promoting your product and services using the award-winning QuickWorkStation POP display. It includes a spacious writing area, ample space for a computer or printer, and has 3 expansive sides for inserting artwork. It can be easily customized and offers a strong attractive front for your customer. Setup takes less than 5 minutes using an innovative collapsible design. ShellCounter is a high quality POP display that's thermoformed using ABS. It can withstand heavy items and impact while giving off a clean contemporary look. Its thermoformed case stores items that do not need to be seen by the customer while fully assembled. 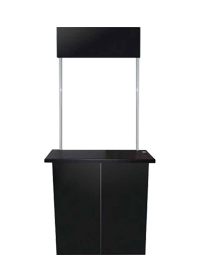 Take your office anywhere with our QuickDesk POP display. It can transform any space into a modern desk with enough space to comfortably accommodate customers. Sit with customers to talk about the advantages of your product or close a deal with the required degree of professionalism using QuickDesk. Display and let customers sample your product with QuickTaster, a fully functional POP sampling cart optimized for the food industry. QuickTaster's durable, stain-resistant surfaces makes it ideal for handling food products in commercial spaces. QuickShowcase allows you to market sensitive products without having to worry about security issues and rough handling. This high quality POP display is ideal for showcasing cell phones, jewelry, and similar valuable items that need protection while being exhibited. QuickShowcase also comes with a small table/tray for additional workspace. QuickCounter is our international award winning POP display that weighs only 12kg/26lbs and can be transformed in seconds into a multi-functional island. Quality construction includes glossy stain-resistant panels that may be combined in different colors per single display. Don't want to compromise quality for portability? QuickXCBT is the best solution for using high quality industrial POP displays. 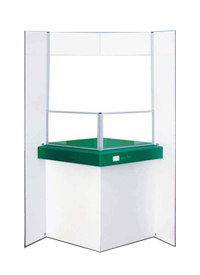 This glass POP display comes with a roomy area to exhibit your products, secured with back doors and a key. 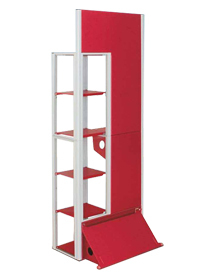 Exhibit all your products with ample space provided by sturdy shelves inside. QuickXCBT comes with all the features for quality point-of-purchasing. QuickRack is an innovative two-in-one rack/shelf display that allows you to exhibit your product while creating brand awareness at the same time. 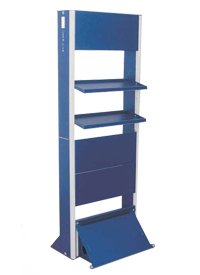 Racks can function as shelves and artwork banners to attract customers. 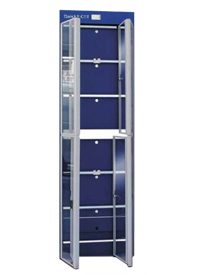 QuickRack takes advantage of the space required to advertise and shelf your product by making it easily interchangeable.